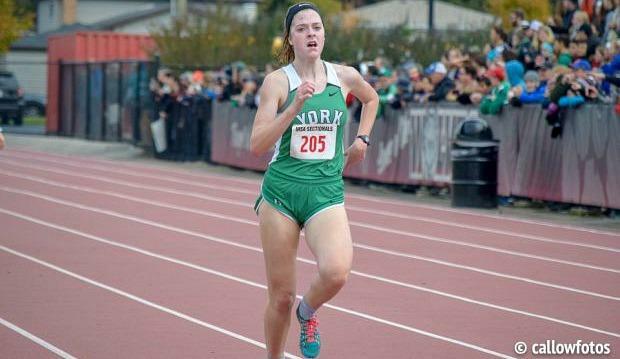 Grace Moriarty is a junior at York High School in Elmhurst and member of the track and cross country teams. Find her covering meets in the Chicagoland Area, specifically the Western Suburbs. Grace wants to be a MileSplit intern because she loves to run and enjoy writing for her advanced journalism class. She sees this as an opportunity to do two things she loves at once. An animal that best describes her is a hummingbird because she is always moving and rarely will you see her sitting still. According to Grace the best event in track and field is the 1600m. Her favorite sports teams are Notre Dame Athletics and the Cubs. The food she enjoys most is anything Italian especially chicken parmesan or gnocchi. She also thinks the best running shoes and sprint spikes are made by New Balance. When it comes to Android and iPhone, Grace is team iPhone.